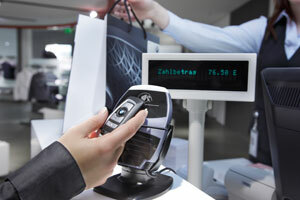 BMW has revealed plans for an NFC-enabled “car key of the future,” according to computerweekly.com. “Our vision is that, in future, the key will not only mean access to the car but, inside and outside the car, will become as it were the ‘key’ to many functions,” said Thomas Kratz of BMW development access and authentication systems division. This vision includes paying for goods at the point of sale, booking and storing train tickets, accessing hotel rooms and much more, all with an NFC-enabled car key. BMW researches have already created a prototype key with an NFC interface that enables for a range of new functions, including “Key Ticketing,” a train ticket buying app, contactless payment app “KeyPayment,” hotel access tool “KeyAccess,” and “KeyInfo,” a service that sends vehicle data from the key to be displayed on a mobile phone. BMW says its new car key is “far more secure” than mobile phones as a payment mechanism, since a mobile’s multiple communications channels (i.e., GSM, Bluetooth and Wi-Fi) are vulnerable to the threat of downloading malware. BMW is also reportedly looking into integrating credit card functions that could allow drivers to pay for fuel, parking tickets, road tolls and acquire new vehicle software all without leaving the driver’s seat.